Now I won't lie when I was given the opportunity to review this product I was a little...what is the right word...leery.lol I love trying new and unusual things though so I embraced this chance to try Skillet Bacon Jam! Of course being concerned about my families healthy I made sure to read through the ingredients and was quite happy to see that I could pronounce all ingredients. You can look at the ingredients here! The first thing I tried it for was eggs, Saturday morning we had decided to make breakfast burritos, it gave them such a great flavor! You could really taste the smoked bacon in the eggs, even the kids loved them. Today I have a pot of beans in the crockpot and decided to replace my usual 2 strips of bacon for a teaspoon for Skillet Bacon Jam. So far they are smelling amazing, I'm sure they will taste great to. There's that bacon jam! I've been waiting for this. Interesting! 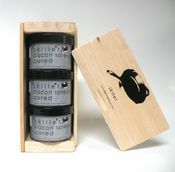 Bacon jam? It does sound like something I'd like to try. It's always good when the ingredients are pronounceable! I reviewed this last year. I was skeptical too, but it was really good. And my husband loved it! I never tried this. SOunds wonderful! I am intrigued! haha I didn't tell my husband I put it in till afterwards he was a little frightened by it.